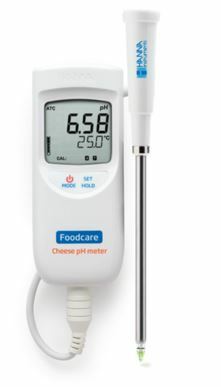 The HI-99165 portable pH meter together with FC2423 combination pH electrode is designed to measure pH during cheese production. 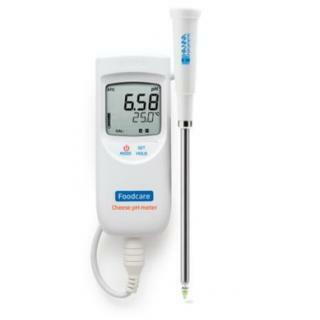 The HI-99165 is a lightweight, portable pH and temperature meter. It features a two button operation system and is simple to use. 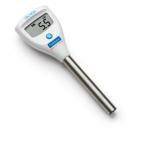 It has a waterproof and compact casing, large dual-line display, and automatic pH calibration at one or two points. The FC2423 is a penetration style pH electrode with a conical sensing tip and features an easy to clean, stainless steel sheath and single junction gel filled reference with a free diffusion sleeve style reference junction. The electrode is designed for penetration into solids and emulsions for direct measurement of pH in cheese products. FC2423 has a built-in temperature sensor for temperature compensated pH readings and an integrated preamplifier to provide measurements impervious to noise and electrical interferences.